A passion for good food – bought locally, cooked simply and shared with friends in Walthamstow, London and beyond. Life in London is so hectic, seem to be running around all the time even at the weekend trying to fit in things that we ought to do, want to do and need to do. It feels like there isn’t any time to relax. So I find that baking my own bread is a chance to have a mindful moment. You have to be focused and prepared for the unexpected – the results are rarely predictable, sometimes the dough seems to have a mind of its own, and I’m left wondering whether the yeast will activate and the dough rise. I love the 10 minutes of kneading time – this is the time to really concentrate entirely on that lump of dough, taking out all of my frustrations from the week as I stretch, bash and squash it. 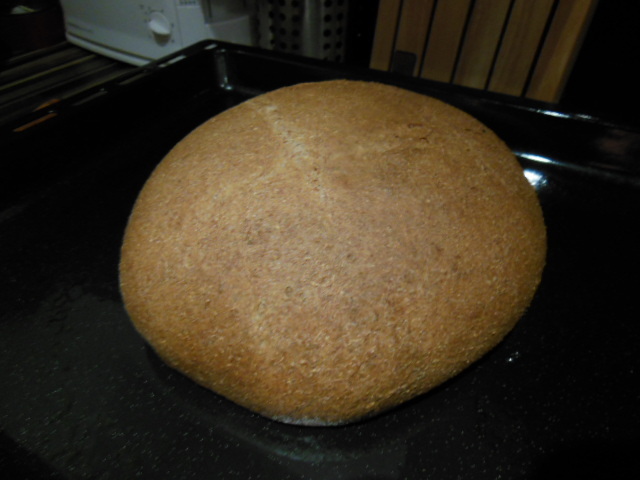 This week I made a wholemeal spelt loaf. Spelt is a more ancient form of wheat, it has more fibre and less gluten than modern commercial wheat, making it easier to digest for people with food intolerances. 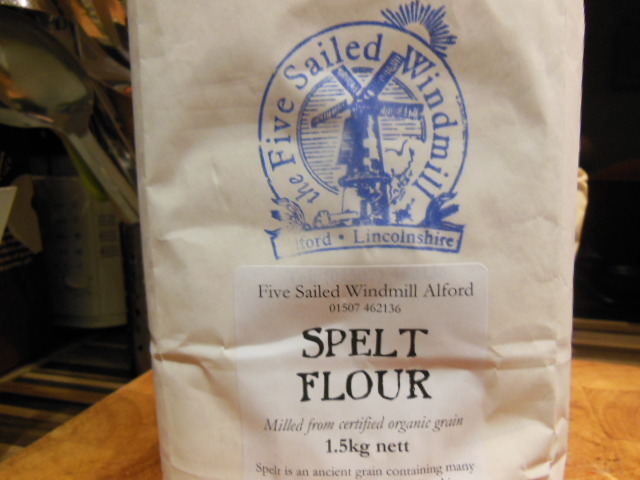 The flour was sourced by our family in Lincolnshire from the lovely windmill in Alford – haven’t found a E17 supplier yet but I’m sure OrganicLea will be able to advise. Spelt bread dough rises quicker than standard wheat making this a faster loaf to prepare and the flavour is delicious and much lighter than I thought it might be. It has a good crust and isn’t a heavy ‘homemade wholesome wholemeal brick’ like my bread sometimes turns out! I’d expect to pay £3 for this kind of loaf at an artisan bakers or farmers market. 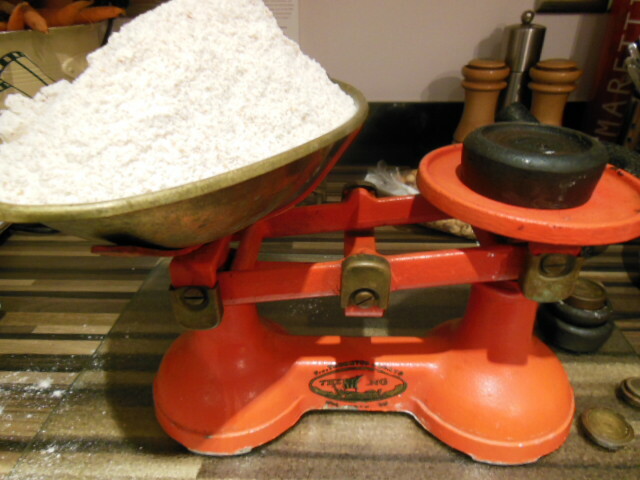 In a large bowl thoroughly mix the flour, salt, sugar and yeast. To explain the photo – the battery died in the clever electronic scales, so we had to go retro and the old fashioned weighing scales were taken off the window ledge and put into active service. Measure out the water – it should feel just slightly warm if you dip your hand in. Add the water to the flour and begin to mix, add the oil and bring the rough dough together. Tip the dough out of the bowl onto a worktop lightly dusted with flour. Now it’s time to work out all your aggression and frustration as you knead the dough for about 10 minutes until it feels smooth and supple. Return the dough to the bowl, cover with a plastic bag or cling film and put it somewhere warm to rise for an hour until it has doubled in size. I find a stool near a warm radiator in the kitchen works well. When it’s risen, turn the dough onto a floured worktop for a second time and gently knead to deflate the dough again. Next, shape the dough into a round loaf and place it onto an oiled baking sheet. Cover with cling film and leave the dough to rise again for 30 minutes back in a warm place. Heat the oven to 220 C/425 F/ Gas Mark 7 and bake on the middle shelf for 35 minutes. 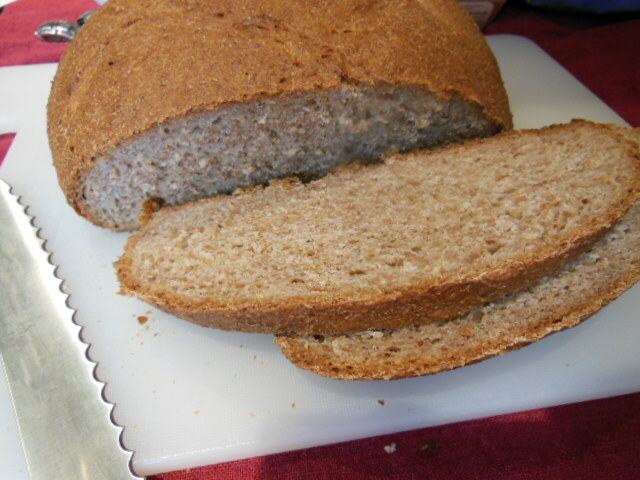 This entry was posted in Recipes and tagged bread, dough, Flour, Lincolnshire, simple, spelt, Whole grain, Yeast. Bookmark the permalink.